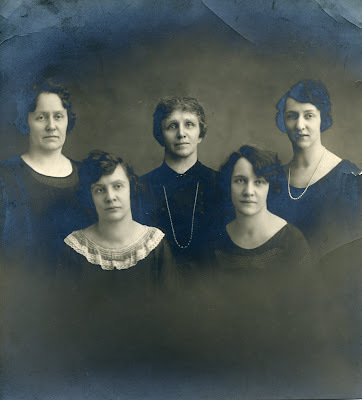 Back row: Katherine "Kate" Reiniger; Ottila (Quade) Reiniger; and Gertrude Reiniger. I have seen this same picture (*.jpg) from a relative of John Reiniger (son of Fred & Franziska). She is originally from the Milwaukee area, but now lives in Washington State. She has been helpful in my work. She was able to lead me to the original family plot at Calvary Cemetery where Fred, Fran, son Frank, his (2) wives and some of his immediate family are buried. If you want, I can contact her and put you in touch. Ottila Quade is not the woman identified in this picture. Ottila died in 1895 shortly after giving birth to the twins Klara & Rosa. Most likely this person is Franklin's second wife, Caroline. I'm unsure of her maiden name, but I believe this was a second marriage for her also. I also believe she brought at least two of her children into Franklin's already large household.